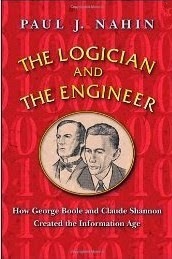 The bits I found particularly appealing were a few introductory logic problems (though I’m not sure I agreed with all the conclusions) and the pocket biographies of mathematician George Boole and information engineer Claude Shannon. However, while technically qualified to deal with the other parts of the book, in truth I couldn’t be bothered – it was too much like hard work. I think the author makes the mistake that many academics make when trying to write for a broader audience: they carry through too much of the textbook, and find that the aspects that often encourage people to remember things in that context (often because they involve repetitious grunt work) actually prevent popular science readers from getting the message. It’s a shame, because the subjects are interesting, but unless you are the kind of person who designs logic circuits for fun, this is probably not the book you’d want to see.